Normally we only have two or three snowfalls during the winter here on the Sunshine Coast of British Columbia. But most days we can look up and see at least a dusting of snow on the mountains. At the foothills of the mountains are acres and acres of forest, so the whole effect can be quite spectacular. 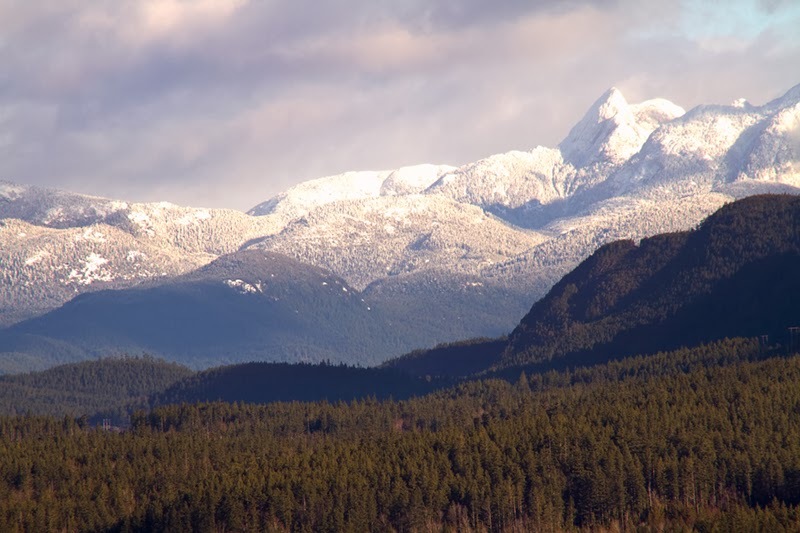 The above photograph is of the Caren range of mountains in the northern area of the Sunshine Coast, viewable in Pender Harbour. The mountains aren't high enough to be covered in snow year-round. You can see power lines running through the forested areas of the mountains...there are many miles of hiking available along these lines, with lots of wildlife viewing opportunities. Roosevelt elk are a common sight, as are black bears and coyotes, but I've also seen wolves and bobcats. I take my camera along on my hikes, but I also pack an air horn just in case I run into trouble. A gorgeous scene, Peggy! I've always dreamed of living where I'll have water on one side and mountains on the other. Ah, bliss! Thanks, Wendy! Yes, I feel very lucky. I've even learned to like the rain!